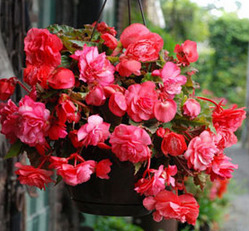 Just like our other super novelty Begonias, Pink delight is fragrant! And extremely new! Your favourite shady spot on a hot afternoon can be festooned with a profusion of cascading, vibrant pink blooms and the scent...well- in a word- intoxicating, Plant this delight in containers or in a prominent raised border location; this Begonia was bred to please even the most discerning gardener. 1 6cm tuber/pkg.